A periodically appearing low-frequency tinnitus is one of my least favorite signals. 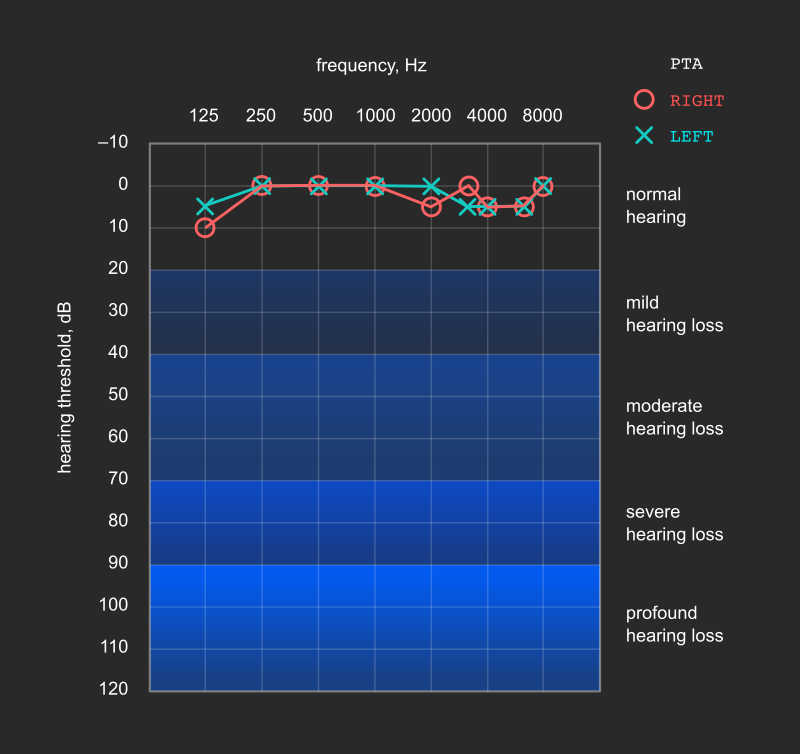 A doctor's visit only resulted in a WONTFIX and the audiogram shown here, which didn't really answer any questions. Also, the sound comes with some pecularities that warrant a deeper analysis. So it shall become one of my absorptions. The possible subtype (Vielsmeier et al. 2012) of tinnitus I have, related to a joint problem, is apparently even more poorly understood than the classical case (Vielsmeier et al. 2011), which of course means I'm free to make wild speculations! And maybe throw a supporting citation here and there. It's nothing new, save for the somewhat uncommon frequency. Now to the weird stuff. I always assumed this was a compression artifact of some kind. Or maybe broken headphones. But one day I also noticed it in real life, when a friend was talking to me! I had to ask her repeat, even though I had heard her well. Surely not a compression artifact. Of course I immediately associated it with the tinnitus that had been quite strong that day. But how could a pure tone alter the whole spectrum so drastically? It's known that a signal gets frequency-shifted when amplitude-modulated, i.e. multiplied in the time domain, by a steady sine wave signal. This is a useful effect in the realm of radio, where it's known as heterodyning. My tinnitus happens to be a near-sinusoidal tone at 65 Hz; if this got somehow multiplied with part of the actual sound somewhere in the auditory pathway, it could explain the distortion. Where could such a multiplication take place physically? I'm guessing it should be someplace where the signal is still represented as a single waveform. The basilar membrane in the cochlea already mechanically filters the incoming sound into frequency bands one sixth of an octave wide for neural transmission (Schnupp et al. 2012). Modulating one of these narrow bands would likely not affect so many harmonics at the same time, so it should either happen before the filtering or at a later phase, where the signal is still being handled in a time-domain manner. The low frequency tone could have its origins in actual physical vibration around the inner ear that would cause displacement of the basilar membrane. This is supported by a subjective physical sensation of pressure in the ear accompanying the sound. How it could cause amplitude modulation is discussed later on. A somatosensory neural signal can cause inhibitory modulation of the auditory nerves in the dorsal cochlear nucleus (Young et al. 1995). If this could happen fast enough, it could lead to amplitude modulation of the sound by modulating the amount of impulses transmitted; assuming the auditory nerves still carry direct information about the waveform at this point (they sort of do). Some believe the dorsal cochlear nucleus is exactly where the perceived sound in this type of tinnitus also originates (Sanchez & Rocha 2011). Already in the 1970s, it was demonstrated that human auditory thresholds are modulated by low frequency tones (Zwicker 1977). In a 1984 paper the mechanism was investigated further in Guinea pigs (Patuzzi et al. 1984). A low-frequency tone (anywhere from 33 up to 400 Hz) presented to the ear modulated the sensitivity of the cochlear hair cell voltage to higher frequency sounds. This modulation tracked the waveform of the low tone, such that the greatest amplitude suppression was during the peaks of the low tone amplitude, and there was no suppression at its zero crossings. In other words, a low tone was capable of amplitude-modulating the ear's response to higher tones. This modulation was observed already in the mechanical velocity of the basilar membrane, even before conversion into neural voltages. Some kind of an electro-mechanical feedback process was thought to be involved. So, probably a 65 Hz signal exists somewhere, whether physical vibration or neural impulses. Where does it come from? Tinnitus with vascular etiology is usually pulsatile in nature (Hofmann et al. 2013), so it can be ruled out. But what about muscle cramps? After all, I know there's a problem with the temporomandibular joint and nearby muscles might not be happy about that. We could get some hints by studying the frequencies related to a contracting muscle. A 1974 study of EEG contamination caused by various muscles showed that the surface EMG signal from the masseter muscle during contraction has its peak between 50 and 70 Hz (O'Donnell et al. 1974); just what we're looking for. (The masseter is located very close to the temporomandibular joint and the ear.) Later, there has been initial evidence that central neural motor commands to small muscles may be rhythmic in nature and that this rhythm is also reflected in EMG and the synchronous vibration of the contracting muscle (McAuley et al. 1997). Sure enough, in my case, applying firm pressure to the deep masseter or the posterior digastric muscle temporarily silences the sound. Tinnitus associated with a physical sound detectable by an outside observer, a rare occurrence, is described as objective (Hofmann et al. 2013). My next plan was to use a small in-ear microphone setup to try and find out if there was an objective sound present. This would shed light on the way the sound is transmitted from the muscles to the auditory system, as if it made any difference. Now I could do a measurement. 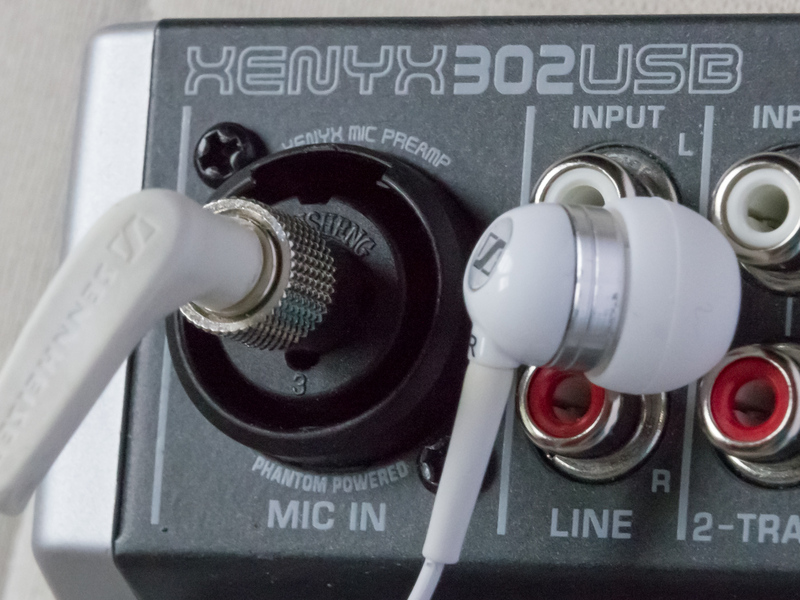 I used my earplugs as a microphone by plugging them into a mic preamplifier using a plug adapter. It's a mono preamp, so I disconnected the left channel of the adapter using cellotape to just record from the right ear. I set baudline for 2-minute spectral integration time and a 600 Hz decimated sample rate, and the preamp to its maximum gain. Even though the setup is quite sensitive and the earplug has very good isolation, I wasn't able to detect even the slightest peak at 65 Hz. So either recording outside the tympanic membrane was an absurd idea to begin with, or maybe the neural explanation is the more likely cause of the sound. My next post, The microphone bioamplifier, starts by exploring this further. Hofmann, E., Behr, R., Neumann-Haefelin, T., Schwager, K. (2013): Pulsatile Tinnitus. Deutsches Ärtzeblatt 110(26): 451–458. McAuley, J., Rothwell, J., Marsden, C. (1997): Frequency peaks of tremor, muscle vibration and electromyographic activity at 10 Hz, 20 Hz and 40 Hz during human finger muscle contraction may reflect rhythmicities of central neural firing. Experimental Brain Research 114(3): 525–41. O'Donnell, R., Berkhout, J., Adey, W.R. (1974): Contamination of scalp EEG spectrum during contraction of cranio-facial muscles. Electroencephalography and Clinical Neurophysiology 37(2): 145–51. Patuzzi, R., Sellick, P.M., Johnstone, B.M. (1984): The modulation of the sensitivity of the mammalian cochlea by low frequency tones. Hearing Research 13(1): 19–27. Sanchez, T.G., Rocha, C.B. (2011): Diagnosis and management of somatosensory tinnitus: review article. Clinics 66(6): 1089–1094. Schnupp, J., Nelken, I., King, A. (2012), Auditory Neuroscience – Making sense of sound. 368 pp., MIT Press. Vielsmeier, V. et al. (2011): Tinnitus with temporomandibular joint disorders: a specific entity of tinnitus patients? Otolaryngology – Head and Neck Surgery 145(5): 748–52. Vielsmeier, V. et al. (2012): Temporomandibular Joint Disorder Complaints in Tinnitus: Further Hints for a Putative Tinnitus Subtype. PLoS ONE 7(6): e38887. Young, E.D., Nelken, I., et al. (1995): Somatosensory effects on neurons in dorsal cochlear nucleus. Journal of Neurophysiology 73(2): 743–65. Zwicker, E. (1977): Masker period patterns produced by very-low-frequency maskers and their possible relation to basilar-membrane displacement. Journal of the Acoustical Society of America 61: 1031–1040. When I open my mouth to the max, the tinnitus I perceive increases in strength by a multitude. I experience this as well. I've had tinnitus for the last 10 years. Mine is basically a flat high frequency that sounds like a tube TV on mute. When I open my mouth wide it becomes much, much louder. The first low-frequency example is something that's called ear-rumbling. People can do that on demand (muscle control), or involuntarily. But it is definitely not tinnitus. There is an entire subreddit dedicated to earrumblers if you're interested. How is that "not tinnitus"? Sounds dubious. I'm an ear rumbler, and I know for one it can be controlled => the low-frequency rumbling can be controlled => muscles in the ear are being controlled => the phenomena can be voluntary. Therefore not persistent, therefore not tinnitus, which is persistent. They are different at the level of permanence - one is temporary, the other permanent. Therefore, according to me, shouldn't be regarded as the same. Tinnitus is completely involuntary => persistent/periodic noise of frequency and amplitude, respectively x Hz, y dB. Changing the topic. Regarding your second audio phenomena. It has happened to me after prolonged ear-rumbling, and disappears after allowing my ears to rest. My self-analysis of the phenomenon is that people with high blood pressure are more susceptible to loud noises, whereas those with low blood pressure aren't. This last part is just my experience speaking. Well those are just some thoughts, nonetheless I like your case study! There are indeed many subtypes of tinnitus - some are not persistent and some can be even controlled by the experiencer, like the TMD subtype described by in the Vielsmeier 2011, 2012 references above. Wow I just realized I have been able to do that for years. My right ear has a bit of a rattle when I do that. Very interesting and thanks for the link to baudline. Regarding your first audio example I always (at least since medical school) thought it to be the equivalent of an eyelid twitch, i.e. spasms of the M. tensor tympani (https://en.wikipedia.org/wiki/Tensor_tympani_muscle). Could be. Though they seem to be usually described as "knocks" or "thumps", i.e. instantaneous sounds with no distinct frequency. If it is of myogenic origin, it would produce sound waves in the tissue, and, due to impedance mismatch, much less sound in the air. Instead of recording in-ear sound you could try electromyography. Muscle contraction produces really strong electrical signals, which can be picked up on the skin. Technically, this is probably easy: you required some electrodes, contact gel, a pre-amp, and a sound-card, I guess. Try Electrocardiography first to in order to practice. Problems will be electrical shielding and contractions of other muscles. If EMG is not effective, you could try laser interferometry of the Membrana tympani to see if the frequency is mechanically present. Probably a bit of a challenge, but quite sensitive. I had low frequency noises in my left ear that has like 60 dBA air hearing loss due to radical surgery, especially after having chewed for a long time. It took more than 6 months to figure out the cause. A prolonged but virtually invisible pharyngitis occasionally making the already thin estachian tube to block combined with pressure build up in the inner ear and apparently still well functioning bone hearing to pick up resonance because the high pressure chamber could resonate easier as the artificial eardrum would now be under tension. A cure with antibiotics solved the problem. The first hospital I checked wanted to do inner ear surgery after an initial CAT scan of the inner ear. I was really glad I declined and had a university hospital do further inspection. It took long, but I'm noise free now. Keep your research going and I think you'll eventually find the exact cause hopefully together with a remedy. Good luck. Thank you for that interesting summary. I tried to find out the source of my (high pitched) tinnitus as well, with little (scientific) luck. I've narrowed it down to the TMJ/trigeminus. Being a computer scientist myself I noticed I picked up some bad habits when I'm working on problem which all include "mouth" habits, on a wide range from sucking in air, building up pressure with my tongue, biting my lips, and chewing (pray that there are no snacks near me when that habit kicks in). It's a subconscious reaction that appears to balance off thoughtwork in the same way some piano players don't know what their facial muscles are doing when they're in the zone. Anyway. I was thinking about the frequency phenomenon you described. I think I remember when listening to binaural beats of the same frequency for a certain amount of time you may even hear their "negative" after-image which modulates naturally heard sounds in a similar way you described, due to the low frequency. Good observation. I also have some long-time stimming habits involving the muscles of the head. very familiar: chewing gum was the first thing I discovered to quit using. Actually I performed during the World Music Contest in 2009 by living a full day on a liquid diet (the noises went away during night and I didn't want the risk to have the noise interfere with our Marching bands performance. With success: we became world 3rd during the marching contest there). Very interesting, kindly keep digging further, do not stop until you have a cure for tinnitus. I'm sure you'll get a Nobel or something. Wow; I had same thought, really this would be Nobel prize territory. When I was young, my Mother took me with her to meet E.C Kendall at his home because she had thyroid problems and his research helped her. Hi! Thanks for the tip. The Xenyx 302 has a XLR/¼" combo connector that accepts unbalanced mic input via ¼" jack, such as I used here. Those combo jacks will take an unbalanced input as you describe IFF you use a mono (TS) quarter-inch plug that'll short the ring and sleeve contacts in the jack. If you use a TRS plug the input is balanced (tip and ring, with sleeve ground). Just where did you use cellophane tape again? Leaving one side of a balanced input open isn't a good idea even if it seems to work. Yes, I think I should have shorted the other channel instead of disconnecting the ring, to get a better signal. I was returning to your page after a long period of time and find you are doing research on tinnitus, reading same articles I have. If you can crack the code of what causes and cures this malady you will get a Nobel prize for sure. I find that none of my doctors have a clue as to the cause. In my case, I started out when young being able to hear the 15,750 Hz horizontal flyback transformer in US (NTSC) televisions. Now decades later my hearing stops at less than 8500 Hz and I can hear a perpetual 12 KHz tone in both ears modulated somewhat by my heart beat. I expect that it is the result of years of listening to punk rock music in my headphones and at concerts. I wish it would go away. I hope you can solve it. A thought, if it is objective source, could some sort of noise cancelling headphones be used? Exactly my experience! 65Hz tinnitus. (But not the frequency shift). Thanks and kiitos from Sthlm for your Case Study! You are very talented. That effect you presented (modulation of voice sample) is often present when you apply a s**load of dynamic compression (especially wideband) on a voice with low frequency below. But it's quite common in real world without any electronic devices in between. You can experience it on a bus or train - the only condition needed is the sounds need to be relatively loud. And this is why it happens - well - it's dead simple. Ears do apply dynamic range compression. And they apply A LOT of it, which is totally consistent with The Weber-Fechner law. And this is why dB scale is not linear to begin with. No biggy. I have the same thing, however mine is at 71Hz and then it will occasionally drop down to 50Hz instead of the higher frequency you have on the recording. I also had a period of a few days where I had the amplitude modulation. Did yours go away? It is driving me mad. I am an acoustic/electrical engineer so I was planning on seeing if I could take measurements of it. Did you get any further on this? This is all I found out about the tinnitus, but see my next post, The microphone bioamplifier for some EMG measurements. My tinnitus is probably caused by what's called temporomandibular joint dysfunction (TMD). I have terrible tinnitus and also TMD which predates the tinnitus. There is definitely some problem with muscles firing. Hello I'm unsure if you're still reading this but I wanted to share a very similar (and ongoing) story. I started with the exact same symptoms on 28th December last year after coming from the cinema. That simulated sound you posted, similar to an SSB broadcast is scarily the exact same way I was hearing everything for a week from my right ear. Music was all out-of-tune and hideous as well. Gradually the distortions seemed to encompass only the 150 - 300 Hz interval until only the 240-270 Hz seemed to be the most affected (or it's just my mind playing tricks). 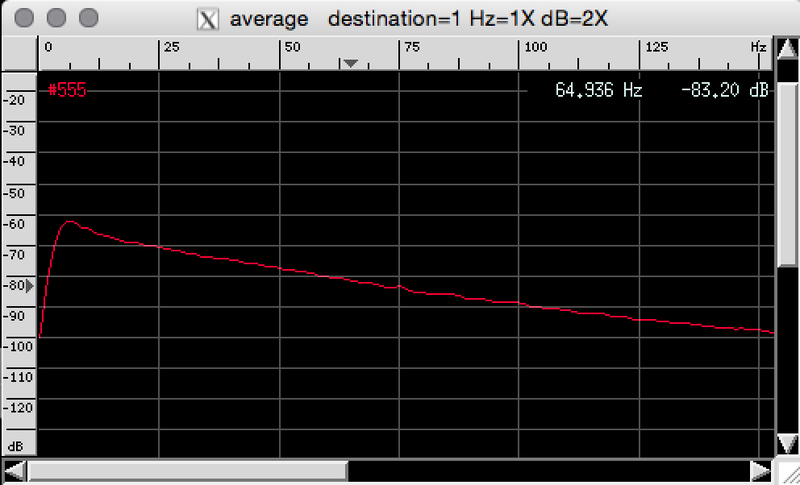 Now I have a very low 250 Hz hum (along with other louder ones at the moment: ~800 Hz and ~2480 Hz). 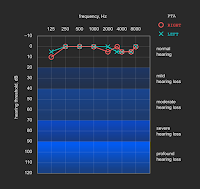 I said my mind may be playing tricks in assuming I still have distortions, because I focused on the initial differences so much that now I noticed my right ear hears everything at 15 Hz lower than my left in the 100-300 Hz interval and my left ear has -10 dB hearing in the low freqs (125 Hz to 500 Hz). In short, music sounds clearer in my left and people's voices' reverberating low harmonics don't seem so pronounced. I guess I should add that I'm usually under stress and even when I seem to consciously feel de-stressed the same cannot be said of my subconscious (I know it from the dreams I have). Wishing all the best to you and everyone who arrived here with weird and stressful hearing symptoms.